My body is quickly accelerating to nearly 120MPH as I fall away from the de Havilland Twin Otter that I occupied at 13,500 feet just a few moments before. On most days a pilot would be extremely concerned by this predicament, but this is no ordinary day. Although the wind is ripping past my ears at speeds that render them useless and nearly every nerve ending in my body is sending alerts to my brain as I fall towards earth from 2.5 miles above, I have a sense of calmness. That reassurance comes from being strapped to the chest of soldier in the U.S. Army, I could not be in better hands. That harness that connects me to Staff Sergeant Matt Acord can withstand more than 10,000 pounds of weight and it is doing its intended job while I enjoy one of the most exhilarating experiences anyone could hope to have. Matt spends so much time in the skies you could call it his office, his jumps are counted in the thousands, and as I spend a day at the office with him I am quickly realizing he may have one of the best jobs in the world. Dancing around me in the sky is Matt's teamate Assistant Tandem Team Leader Staff Sergeant Joseph "Abe" Abeln who is serving as a videographer, capturing photos and video of my experience. I am thankful to have him there because my brain is processing so many feelings and emotions that video will help me solidify this memory as one of the most amazing experiences of my life. The U.S. Army Golden Knights were formed in 1959, as was common at the time, to compete with the Russians for supremacy in the Cold War. 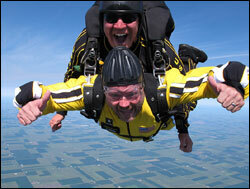 Skydiving as a sport was relatively new and the Russians dominated it. However, the Golden Knights immediately found success and they continued to rack up the gold medals at international tournaments, it was decided the Golden Knights would be an appropriate name for the team. The team is a representation of the finest soldiers and demonstrates the professionalism and skills of members of the U.S. Army. Although today their job seems like all fun and games, in talking to members of the team it is readily apparent these guys have a very serious job and have plied their trade in some of the most challenging places including fighting drug trade in Nicaragua, terrorism in the mountains of Afghanistan and throughout Iraq in our various conflicts there. These men and women serve their country honorably and with great sacrifice but one constant in their career in the military was their passion for the sport of skydiving and through their proven talent were awarded a spot on this elite team. One purpose of a demonstration team like this is to assist in recruiting. Growing up I had little exposure to the military and sadly garnered most of my knowledge of the Army from the movie Stripes. I could see how meeting the Golden Knights could help to inspire others to look more seriously at a career in the military. Each member had his or her own story of why and how he or she joined the military but it was evident that they all firmly believed it was one of the best decisions they ever made. Being a part of the Golden Knights is special to them all. They worked hard to elevate themselves to earn a spot on this elite team. Here they can help expose others to the Army by showing of their skills diving into football games, high school sporting events or at airshows around the world. They love every minute of it, one of the Knights commented that "When everyday you help someone experience one of the best days of their life, you can't help but have a great day yourself." 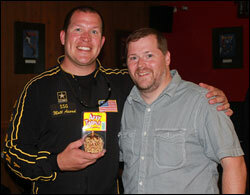 Staff Sergeant Matt Acord is doing just that for me. We are having fun screaming through the skies over rural Illinois. I look around and see farm fields as far as my eye can see, then trace the Fox River and locate our destination, the airstrip at Skydive Chicago in Ottawa, IL. Despite being tethered to another person I have an absolute sense of freedom sliding through the skies. I know this thrill ride only has a few seconds remaining as the ground is getting closer and closer. I see "Abe" float away and I realize he is clearing himself so Matt can pull our chute. We have fallen from 13,500 feet to 5,500 in about 45 seconds. I expected time to fly by but instead felt like I was able to fully enjoy our freefall. I am yanked into up as the chute slows our descent, all of a sudden it is quiet and I am treated to a lovely slow glide towards our destination. During the descent Matt showed off the capability of the parachute by turning us in tight spirals as we floated down. As we neared the ground I lifted my legs up high and we slide into the ground on our butts to a smooth stop on the ground. It took us about five to six minutes to go from 13,500 back to the solid ground but in that six minutes I received a new appreciation the sport of skydiving. One of the team had told me before that even though I am a pilot I had never really flown since I had always flown from the inside of an airplane, and that today I would experience flying for the first time. I now understand what he means, as I was not a pilot controlling a plane, but the actual object that was free to glide and soar so high above the ground. I had promised the team that if they returned me safely to ground I would give them a case of Affy Tapple Caramel Apples from my office. Not sure if that was the driving force in our successful jump or not but I made good on my end of the bargain after they treated me so well. I have much admiration for men and women of our armed forces. I enjoyed spending a day with them, seeing them do what they do best, hearing their stories and joining many fellow civilians in thanking them for their dedication to our country. 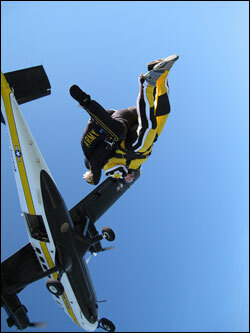 You can learn more about the U.S. Army Golden Knights on their website, Facebook and on twitter. The video shot by Staff Sergeant Joseph Abeln is below as are many of his aerial photos mixed in a with a few I took from the ground. Very jealous... awesome story, photos, video... and opportunity! I just came across your blog and happy to see your post about the Golden Knights. I am on the Team and just wanted to say thanks for the story. I am a new pilot, 55hrs now and just received my plastic license yesterday in the mail. Enjoy reading your blog and will continue. BTW, they did enjoy the caramel apples..
Wow. Those are amazing shots. How fast you must be falling down I'm amazed. I would never be able to jump out of an airplane.